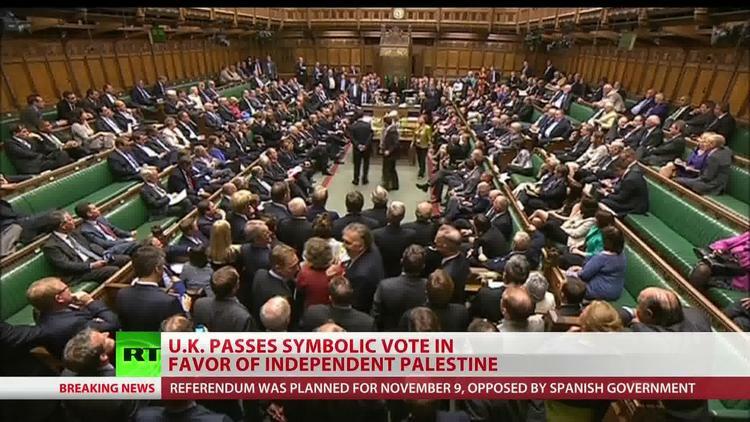 There are 650 members of the British parliament, so the vote on Monday by 271 of them to recognize Palestine is hardly an overwhelming victory for supporters of this position. On the other hand, only 12 voted against. Most MPs seem to have made themselves scarce. The vote was a project of the Labour Party primarily, though some conservatives voted for the measure. the conservative Telegraph newspaper argued that the measure only passed because Labour leaders put enormous pressure on MPs of that party and because they compromised in the language at the last minute to say the recognition of Palestine should be within the framework of a negotiated peace settlement. Ed Milliband and his circle of Labour leaders denied that they had twisted their members’ arms to vote for the resolution. The Conservative government leadership abstained and is very unlikely to follow through on this vote, which in the British system can only be advisory for the prime minister and his cabinet, since they actually make foreign policy. It is a significant development, however, because Labour could eventually come back to power and might well pull a Sweden by actually recognizing Palestine. The European Union is moving gradually in this direction. Although the EU is most often thought toothless in the Arab-Israeli conflict, its positions could have a big impact. Some 33 percent of Israeli trade is with Europe, and it depends heavily on technology transfers and de facto membership in many EU organizations. The effect of the recognition of Palestine by EU member states is to give Palestine standing to pursue legal complaints in European courts. Israel is plainly in contravention of the Geneva Conventions of 1949, which forbid a military occupying power to flood occupied territory with its own citizens, as well as of a number of EU statutes. Palestine could theoretically take West Bank squatter enterprises to court in EU states and win big judgments. Many Israel companies have European operations or even branches and are vulnerable to such judgments. Businesses and other institutions of civil society are already boycotting Israel over its West Bank squatting. So the immediate practical impact of this vote is small. The symbolic impact is quite large. But the most important thing about it is that it points to the future, a future disadvantageous to Israel economically, technologically and politically, as long as it continues its massive land grab in the Palestinian West Bank.